Black Mug 20 oz. Black Mug 34 oz. White Mug 20 oz. White Mug 34 oz. 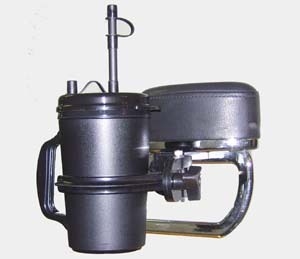 Drink Holder for Driver, handlebar or clutch/brake bracket, Large 34 oz. 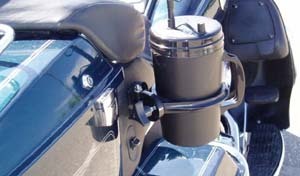 Drink Holder for Driver, handlebar or clutch/brake bracket, Small 20 oz. BDS-P Python: Introducing the new “PYTHON” BDS bracket. We call it the “PYTHON” because of its extreme strength and holding ability. As with any BDS the “PYTHON” kit comes complete with all necessary components and the ring and mug in either 20 oz. or 34 oz. size. This new bracket is machined aluminum with a beautiful finish, and it is designed to install on almost all motorcycles by using the “two-bolt method” or the “around the handlebar method”. The “PYTHON” complements the extreme mug holding capability of the BDS system and looks great even if chrome is predominate on your machine. 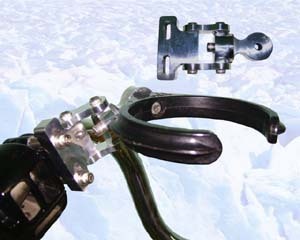 Python Clutch Mount: BDS enthusiasts have been installing their drink holders using the “two-bolt method” for many years and the “PYTHON” bracket still allows for this type of mounting. With the “PYTHON’S” unique five degree of freedom design there is no problem positioning the system to level and direct the holding ring to any position that is best for the motorcyclist. Python Bar Mount: If the “two-bolt method” of mounting is not practical on your bike the “PYTHON” will mount directly to your handlebar. 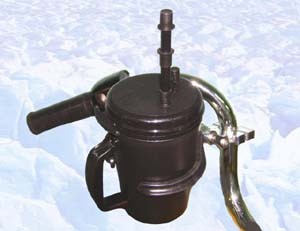 It is designed to accommodate handlebar diameters from 7/8 inch to 1-1/2 inch. And, it still maintains the five degree of freedom allowing it to be positioned properly. 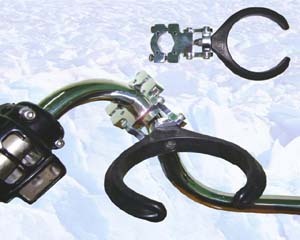 With this bar bracketing capability, the “PYTHON” can be installed on crash bars or grab rails making it adaptable for passenger use on some motorcycles. 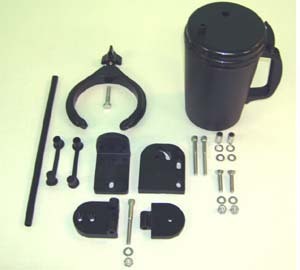 This set includes an Adjustable Mounting Bracket, Mounting Bolts and Hardware, 20 oz. or 34 oz. Compression Ring, 20 oz. or 34 oz. Insulated ThermoServ Beverage Mug, Standard ThermoServ Lid, BDS Extreme Lid, Seal-Fit Straw and two Straw / Vent Caps. 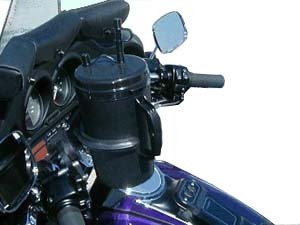 The bracket is polish finish machined aluminum designed to attach to the motorcycle in one of the two ways described above with all required parts included in the kit to mount it either way. 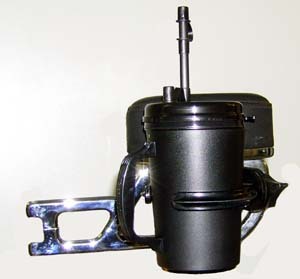 BDS Style: Model for the driver for the handlebar or clutch/brake mount. Each Set includes an Adjustable Mounting Bracket, Mounting Bolts and Hardware, 20 oz. or 34 oz. Compression Ring, 20 oz. or 34 oz. Insulated ThermoServ Beverage Mug, Standard ThermoServ Lid, Extreme Lid, Seal-Fit Straw and two Straw / Vent Caps. 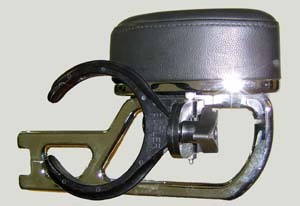 BPS Style: Model for passenger like above but for mounting to our AM-24 Armrest. 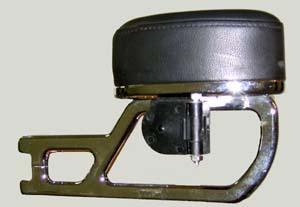 UBL Style: Model for passenger like the BDS style but a universal mount that can be attached to the H-D Ultra Classic Speaker Housing.